Brett Carroll, of Meeker, rides a bucking bronc with a broken cinch Saturday during Wild West Weekend at the Moffat County Fairgrounds. The inaugural event, which also included a barbecue and a dance, drew an estimated 300 to 400 people, committee member Glenda Bellio said. — Glenda Bellio, Wild West Weekend committee member, about attendance Saturday for the inaugural event at the Moffat County Fairgrounds. Sure, bull riding and barrel racing are entertaining to watch, Stephanie Ahlstrom said. 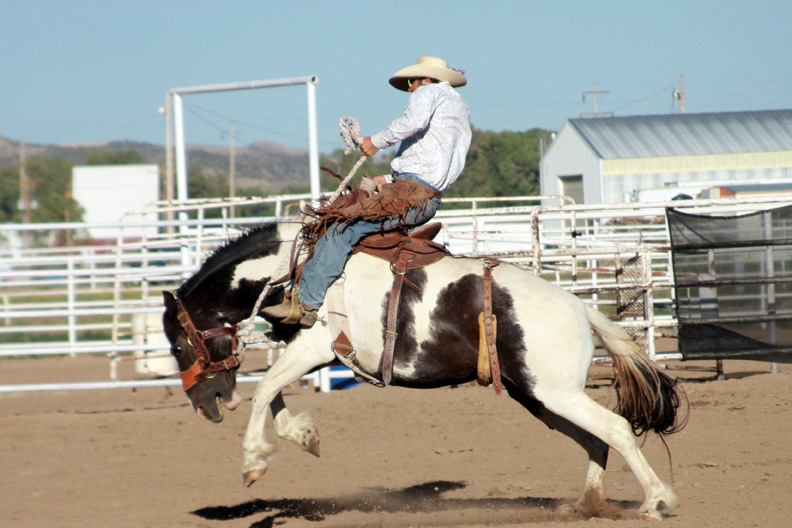 But for rodeo-goers who want a taste of what happens on a working ranch, the bronc riding and sheep hooking events at the first Wild West Weekend hosted Saturday were the real deal, said Ahlstrom, one of the event’s volunteers. Wild West Weekend also featured a barbecue and dance with live music provided by the Baggs, Wyo., band “Train Wreck,” and drew an estimated 300 to 400 people to the Moffat County Fairgrounds. “For a first-year event … we were thrilled with the turnout,” said Glenda Bellio, one of the event’s committee members. “I was pleased with the results,” she said. Wild West Weekend is unique because it offers events authentic to daily life on a ranch, Ahlstrom and Bellio said. Sheep hooking, an event where participants try to snag a sheep’s leg with a hook attached to at 12-foot pole, “has been around as long as there’s been sheep,” Bellio said. “Unfortunately, too many of us that have rode a horse (have) rode a bucking horse,” she said, laughing. Saturday’s action wasn’t confined to the chutes and the arena. The dance drew residents from Meeker, Hayden, Baggs, Wyo., and the Front Range, Ahlstrom and Bellio said. All together, the event featured all the trademarks of a “cowboy Saturday night,” Bellio said. Proceeds were earmarked to benefit Future Farmers of America Alumni and Wyman Museum. The latter hosted the barbecue and earned money through the meal’s ticket sales. Wild West Weekend as a whole fell just short of breaking even, but “we expect to do better next year,” Bellio said. In the minds of many people who attended Wild West Weekend, though, there’s little doubt the event will continue. Based on the comments Bellio heard from participants and attendees Saturday, “it was a given that we were going to do this next year,” she said.